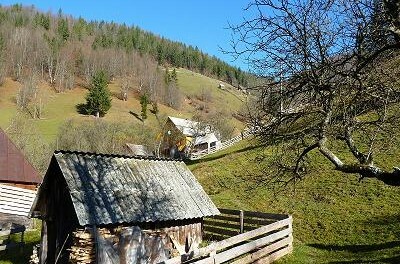 This week, Romania received the formal approval from the European Commission for the starting of the National Rural Development Plan (NRDP) for the 2014-2020 time frame. This enables the Romanian Ministry for Agriculture, to launch all measures of the program. Formal declarations were made at the end of an official meeting in Bucharest, between Phil Hogan, European Commissioner for Agriculture and Daniel Constantin, Romanian Minister for Agriculture and Rural Development. 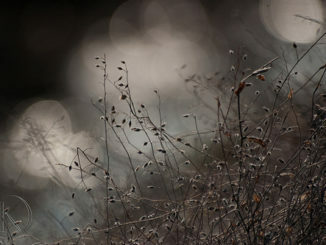 A delicate matter was raised during the discussions. The Romanian authorities requested the re-designation of the “Less Favored Areas” (LFAs) of the country, given the fact that some of the provisions led to the exclusion of vulnerable areas which were formerly part of support plans. Commissioner Hogan underlined that the issue is known at an EU level but that “there is a regulatory problem which cannot be solved”. A paradox situation, given the fact that the Romanian Ministry for Agriculture accomplished the re-designation in the first place. LFAs are geographical areas where agricultural production is qualitatively and quantitatively lower due to natural constrains like altitude, slope, hydration and quality of soil. Most areas like these are located in the highlands and mountains, only a few being defined in the lowlands and plains of Romania. Support for LFAs – defined through articles 31-32 from the 1305/2013 EU Regulation, represents a huge deal for Romanian farmers, as through this measure they would receive compensatory payments which would enable them to continue farming in these naturally constraining areas. Along with the new NRDP development, the LFA map suffered a radical change. Why did this happen? A year ago, in April 2014, the Ministry developed the first draft of LFAs re-designation. 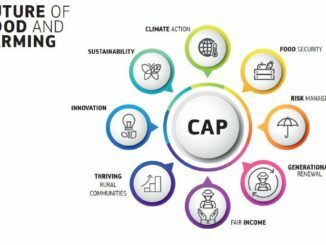 The draft was issued together with an official methodology used for designating these areas, the package being fine-tuned at the beginning of 2015, the final version not baring any radical changes from the original draft. 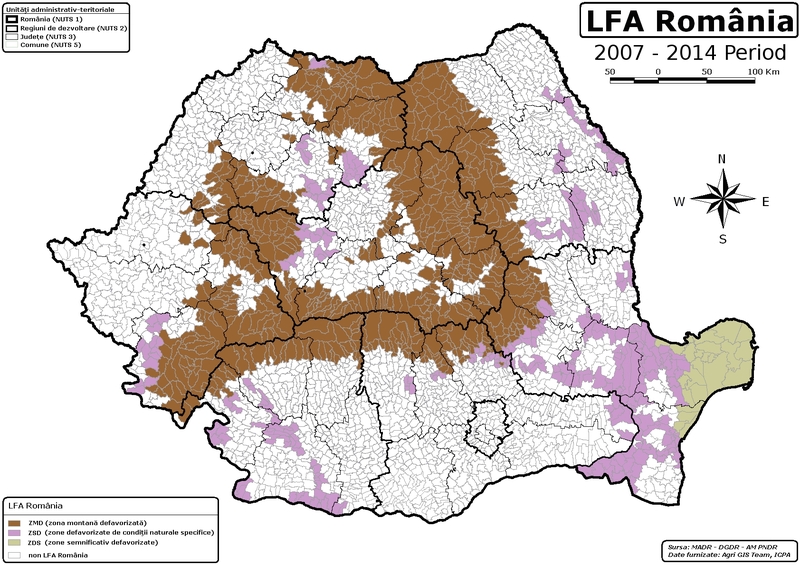 If the two LFA Maps of Romania were to be compared (the one from the 2007-2013 NRDP and the one proposed for the 2014-2020 interval), we would observe radical changes. The formerly declared unfavored areas (magenta on the 2007 LFA map above) of the Transylvanian plateau or the highlands of the Romanian and Moldavian plains, which also host the majority of the Romanian peasant farmers, were excluded almost totally, giving way to the Western and Romanian plains and lowlands of Romania, also internationally recognized as the Chernoziom belt of Europe, the most fertile soils of Romania. To emphasise: if you look at the 2007-2014 map, you will see the LFAs in magenta. These regions got more money than usual, as they are “less favored”. On the new map below, LFAs are marked predominantly pink, and indeed a lot more areas were included, while others (magenta on the other map) especially in the central and north eastern parts of the country were excluded. Who are in the pink areas of the new map? All the landgrabbers, oligarchs who farm on the most fertile soils of the country, having huge consolidated farms, who have numerous bonuses and benefits already. They do not need any more support, but they lobbied like hell and squeezed out even more juice from the CAP. 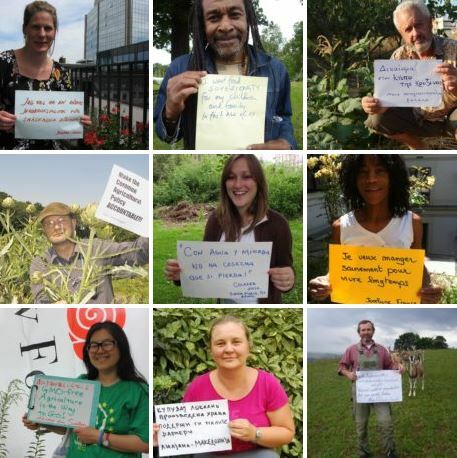 So in the next seven years, most of the old LFAs (the real LFAs, the majority farmed by peasant communities) will get zero support through this measure. So who are the majority rulers of these newly defined “less-favored areas” (pink areas of the 2014 LFA map)? 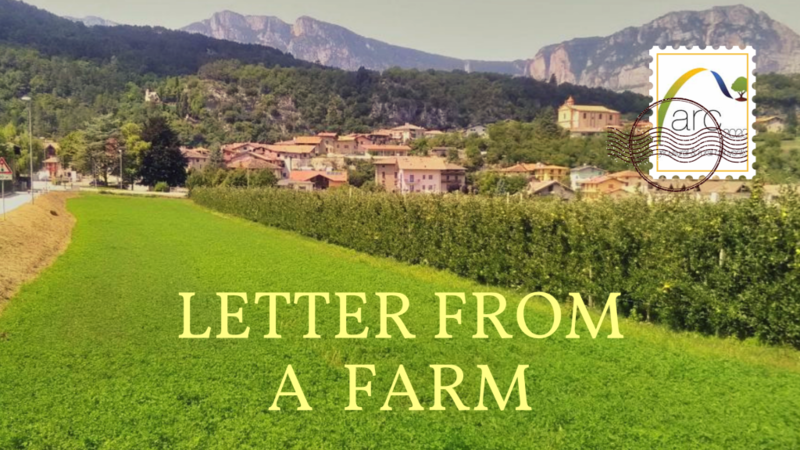 Large agroindustrial farms and holdings – international companies and Romanian oligarchs – that already benefit from millions of EU subsidies. Most of them represent the 1% which under the old Common Agriculture Policy (CAP) absorbed 50% of the direct payments received by Romania. According to the new LFA plan the majority of them would benefit from even higher direct payments and a 20% higher EU support rate under Pillar 2 measures (example: for a 5 million Euro investment, the EU support would be as high as 1 million Euro). All because they are now defined as “less-favored”. On the other hand, areas which should benefit from this aid become even more disadvantaged. As a first impact, through the bankruptcy of small farmers, the poverty rate along with land abandonment would increase to even higher levels. In conclusion, the current re-designation of Less Favored Areas in the new NRDP of Romania would have as an effect the annulment of its very purpose: to avoid agricultural activity abandonment in lower productivity areas of the country. Local authorities eliminated from the new LFA map are in a complete fog. “I do not have any clear information, but I know that in 2007 and probably now too, at the basis of these decision stand biophysical studies issued by subordinated research institutes from Bucharest. We were not consulted on this matter”, stated a director of the Bacau region Agricultural Department, a disadvantaged area where dozens of villages were excluded from the new LFA map. One of the mayors of these villages declared that “the ones which made this decision do not know where our commune lies and what agricultural restrains we face”, mentioning that the farmers from his commune (settlement defining several villages) request agricultural subsidies for a total of 1200-1300 hectares. The extra 80 Euro subsidy which the commune received as part of an LFA, and now is deprived of, represents a loss of over 100.000 Euro. “The loss is great for both sectors: crop production and animal farming. Five years ago, before this support, only 20-30% of the agricultural potential was worked, now it is 100%. Without this extra support we don’t know what will the future bring. I don’t know who did the changes and why, but I would be very interested to find out…”, declared another mayor. On a higher level, even national MP’s are confused. Deputy Viorica Marcu, also member of the Agriculture Commission of the Romanian Parliament acknowledges that the decision created “disagreements between mayors and farmers, as LFAs mean higher subsidies and benefits for public and private recipients”. Another Deputy of a disadvantaged area – Dolj, stated that “150.000 citizens of the Dolj county will be excluded of accessing EU funds as they no longer meet the eligibility measures of less-favored areas”…”for example, the Danube valley, where the county holds its best soils is declared as a disadvantaged area, while the North (highlands) is excluded”, pointed out Deputy Petre Petrescu. 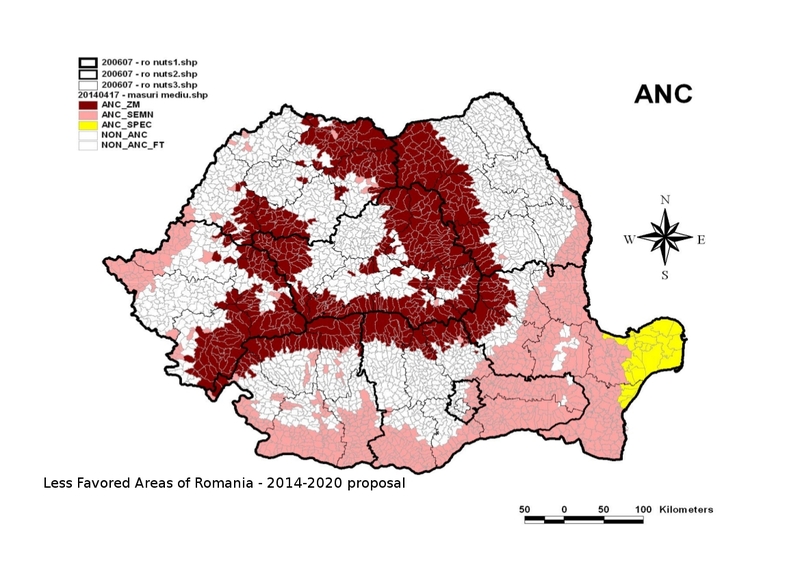 Excluding these areas from the newly created “Less Favorable Area” database of the 2014-2020 NRDP, the Romanian Government will no longer be able to take rehabilitating measures in order to re-balance soil acidity, erosion and social-economic factors of exclusion. Most farmers from these areas are old or lack the financial potential. 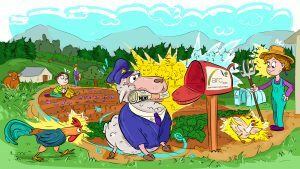 The purpose of allocating 1.6 Million Euros of EU funds is precisely to correct these shortcomings, not to feed the capital accumulation of already giant agroindustrial companies. Peasants, local and national deputies and rural communities all share the same dilemmas: Why did the map radically change and where does it leave them?